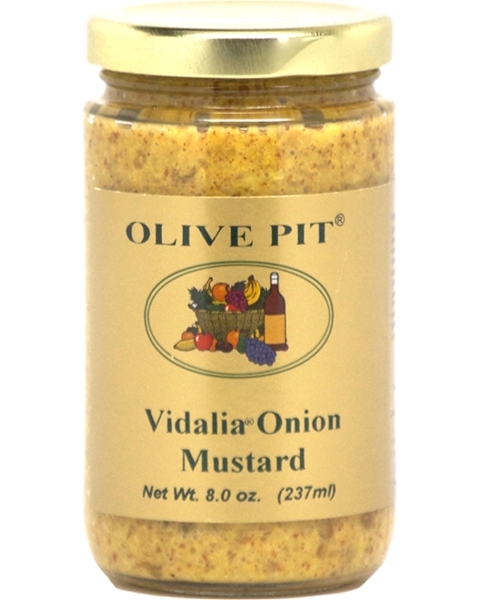 Our mustard is made with the mild and sweet Vidalia onions and blended with Dijon. Great on sandwiches or added to your favorite recipe in dressings, veggie dips and sauces. on 4/18/2017 Delicious in egg salad! I love this mustard, it is so different, yet works with anything I usually use mustard for. It has a different consistency - creamier! It's subtle flavors are perfect as an added touch to egg salad or pickled eggs! This is an amazing mustard! The sweet complex flavor is unique and delicious. I enjoy it the most with bratwurst or pastrami. I am ordering more as I was also rationing the last bit. I am also ordering more for gifts. on 9/26/2013 Can't wait to restock in my cupboard! We happened upon the Olive Pit when driving down I-5 after visiting friends in northern CA in 2010. On a whim, I picked up one jar of this mustard to try. It was so good that I had to ration it to make it last! We're headed back north soon and I will not make the mistake of getting only one jar again! It's particularly delicious on a ham sandwich or spread on the bun of a bratwurst or other sausage. This product is so good I am buying it to give as a gift. Great flavor mustard never tasted so good.